Let’s just say there would be no The Culinary Cellar if not for Andrew Wilder. Andrew built and maintains my blog, something my non-technical mind could never do alone. He lives in California, I have never met him, but he is still my hero. My daughter Kristina knew of him because they both graduated from Northwestern University, and he was also highly recommended by other food bloggers, so he maintains Kristina’s blog too. It’s all in the family! A great bunch here! I was thrilled with The Cookbook Library from Anne Willan as it was one I had on my list to buy someday. 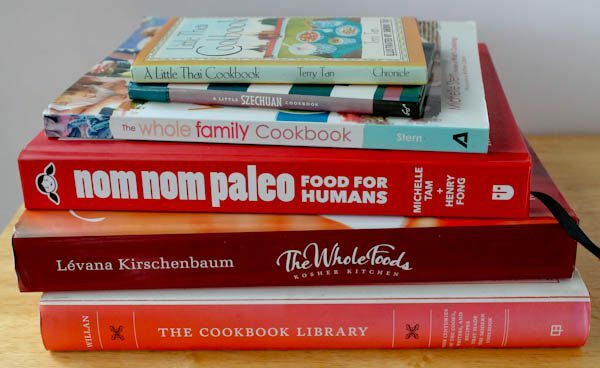 I love healthy cooking books too, and have never had a paleo one before so this was fun! 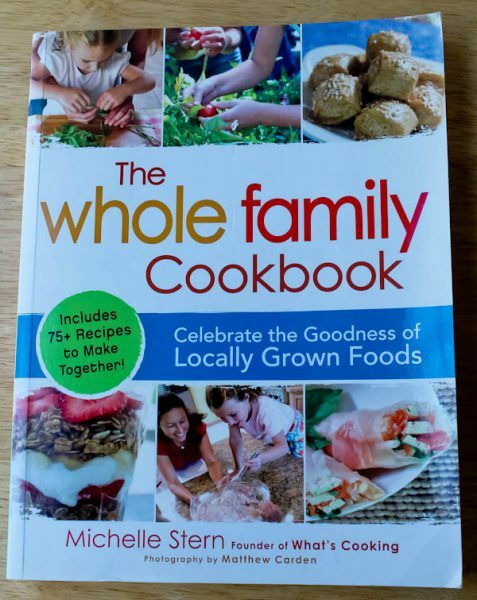 I looked through all of them and found many recipes I would love to try. I found one that sounded like something my Bill would enjoy for dinner and used fresh sage which I love. 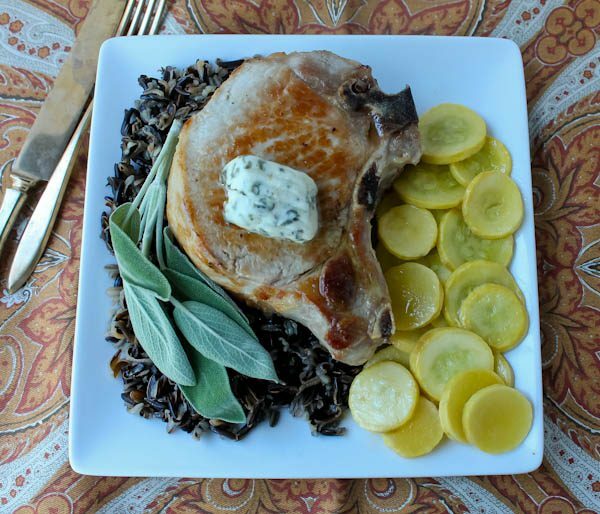 It was pork chops with a fresh sage and lemon butter from The Whole Family Cookbook. 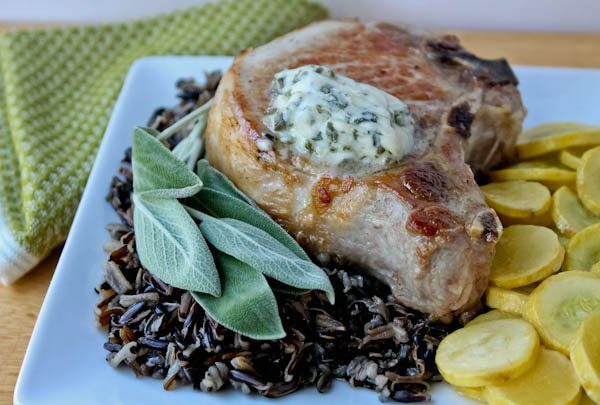 The pork chops can be made stove top or grilled, then topped with a rich and luscious sage butter, placed atop the hot chops and allowed to melt. The butter is easy to make and would also be wonderful with Thanksgiving foods which I am definitely going to do. It’s would be good on biscuits, rolls, vegetables, and rubbed under the skin of the turkey. For our dinner, I added some wild rice and yellow squash. Not only delicious but a gorgeous fall meal. If anyone needs help with starting or maintaining a blog, Andrew is your man. You can find him at blogtutor. Be sure and read about Andrew’s impressive resume on his site. He is very well-respected among food bloggers and has high-profile clients like food writer and cookbook author David Lebovitz. Andrew in an expert in both the culinary and technical fields, speaking at conferences like the International Association of Culinary Professionals, Food & Wine, BlogHer, and Techmunch, and been profiled in the Los Angeles Times, New York Times, and Eating Well magazine. He is also the creator of the popular food blog Eating Rules (great recipes there!) and the annual October Unprocessed challenge, which has helped more than 30,000 people change their lives by cutting out processed food. Thank you, Andrew, for the lovely books and for maintaining my blog, which is getting to the part 2 of its existence. I have some new ideas for the new Cellar, so you will be hearing from me soon! Pick the sage leaves from the stems and measure ¼ cup. Mince them finely. Melt 1 Tablespoon of the butter in a skillet. Add minced sage to the melted butter and allow to simmer 2-4 minutes. Remove from heat and stir in garlic. Allow to cool for several minutes. 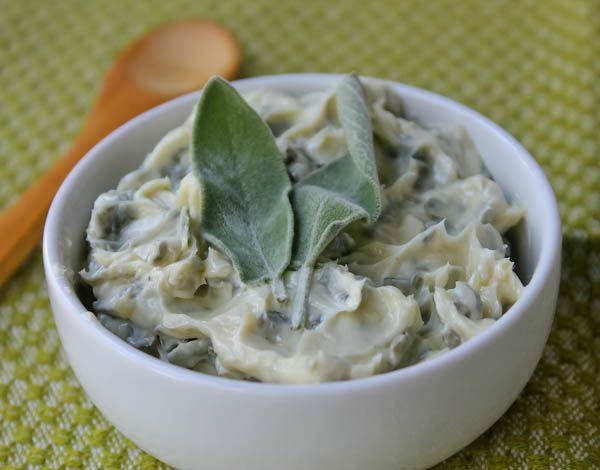 Add sage butter to remaining softened butter and stir to combine. Stir in lemon juice, and salt and pepper, to taste. Set aside. For chops, season them with salt and pepper on both sides. Wash hands. Heat a heavy frying pan over medium-high heat. Add 1-2 Tablespoons olive oil or enough to lightly coat the pan. Sear the chops for 3 minutes on the first side, turn over and cook for 2 more minutes and then turn off the heat. The meat will continue to cook in the pan. Using an instant-read thermometer, take the temperature of the meat. The internal temperature should be 160 degrees F. when finished. 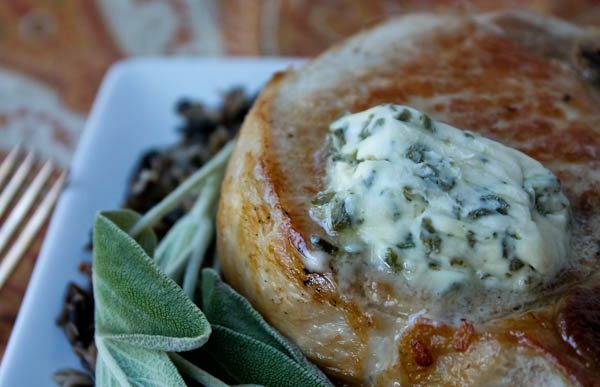 To serve, place chops on serving plates and add a dollop of sage butter on top of hot chops. The heat of the chops will melt the butter and release the fragrance of the sage. Serves 4. So very thoughtful of Andrew to send the cookbooks! He sounds like a great guy!!! !